This traditional Christmas cake was invented in France, where it is known as 'bûche de Noël'. It's basically a chocolate Swiss roll covered in chocolate ganache and make to look like a log. Quite easy to make and very impressive to look at. Preheat your oven to 160°C (320°F) for a fan oven, 180°C (365 °F) conventional. Grease a Swiss roll tin with butter and line it with greaseproof (parchment) paper. If you don't have a Swiss roll tin, you can use a baking sheet with a rim that is about 2cm (just under an inch) high. Rub butter on the bottom of the tray to hold the paper flat. In a separate bowl, beat the yolks until creamy. Add the sugar, breaking up any big lumps, and whisk until smooth. Now add the salt, spices, and cocoa powder. Whisk until you have a smooth paste. Now carefully fold in the egg whites, being very careful to not knock the air out of them. Spoon the mixture into the prepared baking tin and spread it out to form a thin, even layer. Bake for 20-30 minutes. When cooked, the sponge should spring back when you poke it with a finger. While the sponge is cooking, make the ganache. Heat the cream in a saucepan on medium heat until it is too hot to comfortably put your finger into, but not boiling. Break the chocolate into small pieces. Remove the cream from the heat and add the chocolate chunks. Stir until the chocolate has melted. Put the ganache into the fridge or freezer to cool down and firm up. The butter needs to be soft but not melted. Whisk it in a bowl until smooth. Blend in the sugar and beat until it comes together in a ball. Add 1 or 2 tablespoons of cream (or you can use milk) and some vanilla essence. Stir until smooth and set aside. When the sponge is baked, put a sheet of greaseproof paper on your worktop and sprinkle it with caster sugar. Turn the baking tray over and release the sponge. Carefuly peel the first layer of paper away from the sponge. Score a line about 2.5cm (1 inch) away from one of the long edges. Lift up the edge of the greaseproof paper and carefully roll the sponge up. Don't roll the paper inside the sponge. Set aside to cool. When the sponge is completely cool, gently unroll it. Spread the buttercream all over the top of it and roll it up again. Put it in the fridge to chill. Cut about a quarter of the roll off on the diagonal - this will become a branch off the log. Spread some ganache over the cut end of the branch and stick it onto the top/side of the log. Cover the whole thing with ganache. I don't usually do the ends because I like to see the exposed sponge with the spiral of cream. With a fork, scrape lines in the ganache to make it look a bit like bark. Sift some caster sugar over the top and sides, and decorate with pine cones, holly, plastic robins or any other small Christmas trinkets that you happen to have lying around. The video above is from the Keef Cooks YouTube channel. 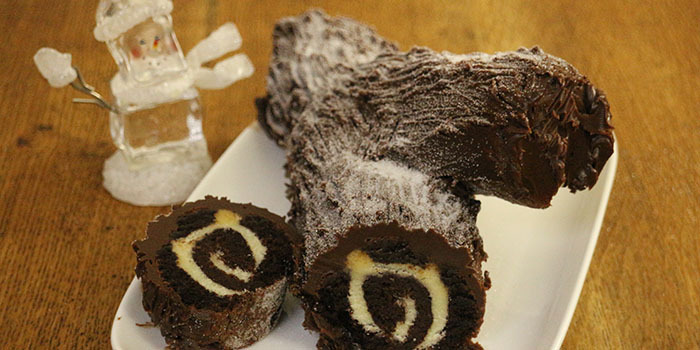 Click here to see the video recipe of Christmas Yule Log on YouTube. Prep time: 20 minutes. cooling time: 30 minutes.